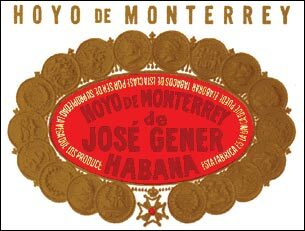 The "Hoyo De Monterrey" brand was registered in 1865. But in the town San Juan y Martinez, in the Vuelta Abajo you still can find a wrought-iron gate with the inscription 'Hoyo de Monterrey, Jos' Gener, 1860', which indicates that Mr. Gener used to be a tobacco grower earlier, before 1865. This mark has undergone deep changes, but still keeps its traditional packaging. Smokers appreciate these cigars because of their right fragrance and flavor, pliability, no excess of light tobacco in blend, excellent draw and burning properties. Undoubtedly this brand is one of the best in the new generation of cigars. It has delicate aroma and slightly mild, but elegant and complex taste. Nearly all sizes of the "Hoyo De Monterrey" cigars are usually packed in special sliding cases.